'The Pulse Way' is the guiding forcing behind everything that Superleague's newest franchise does and it is something that Ash Neal and the rest of the squad live by. 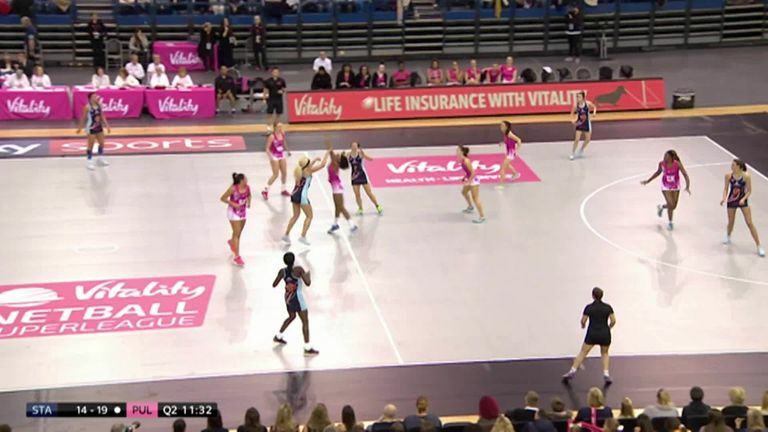 The Australian, like each one of their players, joined London Pulse at the start of the new term as they took their place in the Vitality Superleague. Neal has arrived to play for her fourth UK franchise with a wealth of experience and a passionate desire to be part of creating something significant and lasting for netball in the capital. Part of Team Northumbria last season, Neal's move to London was driven by her former team-mate and good friend Natalie Seaton. Neal has immersed herself in the franchise, working in their office during the day alongside being a key part of the playing roster. That combination makes her extremely well-placed to lift the lid on Pulse's modus operandi. "Everyone is working towards the same goal, we always train with a work ethic and nothing is ever done half-heartedly," Neal told Sky Sports. "We care about each other and everyone looks out for each other. We call it 'The Pulse Way' and we look to keep raising the bar. We're never happy with where we're training at [levels] and we want to set it higher." Neal, who has started every match this season, is quick to highlight the dedication of chief executive Seaton when it comes to shaping the franchise's past and future. "She's phenomenal. Nothing ever leaves without her seeing it because obviously she's got this vision that she wants to see Pulse as," noted Neal, a team-mate of Seaton's at Surrey Storm. "The way that we run things, the professionalism. She literally never stops working, she always works and she is the driving force and is the reason why a lot of people love Pulse. "She's created the culture, the expectations and the standards in the young group and I guess that's showing in how successful they've been in the younger age groups in the past two years. Her expectations as a player were large and that's the way that she's brought these players up." As Neal says, Pulse's success at U17 and U19 levels has created a platform and the franchise's commitment to driving the next generation was highlighted by Seaton before the season even started. "I want to win but it is also about creating a sustainable team that can go forward year-on-year and be continually successful, while also giving the young players we have already been working with their chance," Seaton told Sky Sports in July when discussing recruitment for the NSL season. "They might not be ready yet for seniors but we need to start giving them the exposure so we need a blend of old and new, players not necessarily from the UK or have played in the UK - it's going to be a melting pot of everything that we hope we can turn into a winning formula." Neal admits the team came together late. While many franchises enjoyed around three months of pre-season training, half of Pulse's squad only assembled in late October. Indeed, most united in late December and even after that Ama Agbeze's international commitments - returning from a knee injury with England A - kept her away a little longer still. With the presence of younger squad members like Jasmin Odeogberin, Olivia Tchine and Kira Rothwell, the experience of Neal and Agbeze is vital and the former is relishing her leadership role. "I love having young players in a squad because even though I'm classed as experienced, I'm not afraid to listen to their feedback as well," said the Australian, who can ply her trade at C, GA or WA. "The young players have really grasped what myself or Ama pass onto them which I think is really nice to see. As well, they're not afraid to speak up if we're not doing something right and we're happy to give feedback and help them along." Agbeze's signature was arguably one of the most important for London Pulse and Neal highlights exactly what the England centurion brings to the franchise. "Other than a world of experience, she's just a great character. You're just drawn to her as a person, as a character and as a leader. "Everything she says, I just find myself nodding and smiling thinking, 'Yep, yep'. I think that's the response players generally have with her because she leads by example. "She isn't just a captain that talks all the time and tells you what to do, she leads by example and I think that's a really good quality and one that some people struggle to show as a captain." Next for Superleague's newest franchise is a trip to Belle Vue to face Manchester Thunder before Surrey Storm visit the Copper Box Arena in Round 5. With her role at the club and duty as a player, Neal is acutely aware about driving netball in London and inspiring the next generation. "When I'm signing after games and I'm meeting some of the school kids I do like to have a little conversation and ask them where they play and what positions they like to play. "I think that only fuels their dreams and aspirations and I think for the first team in London, that's a big thing. "A lot of supporters were having to commute before, either to Surrey or to Hertfordshire, and I think now it's on their doorstep we'll get a lot more girls in London involved in sport." So the final question for Neal is how do London Pulse want people to view them and their delivery of 'The Pulse Way' come the end of their maiden Superleague season? "It doesn't matter at the end of the day what name you have on the back of the dress, it's about how you perform on the day. "I really want us to be viewed as competitive with a never-give-up attitude. I want people to say that we fight until the last whistle, we give everything and we don't rest on any laurels." Watch London Pulse's meeting with Manchester Thunder on Monday, February 4 live on Sky Sports Mix and Arena from 6.45pm. Also, Sky Sports will be showing every game of the 2019 Vitality Netball World Cup in July.